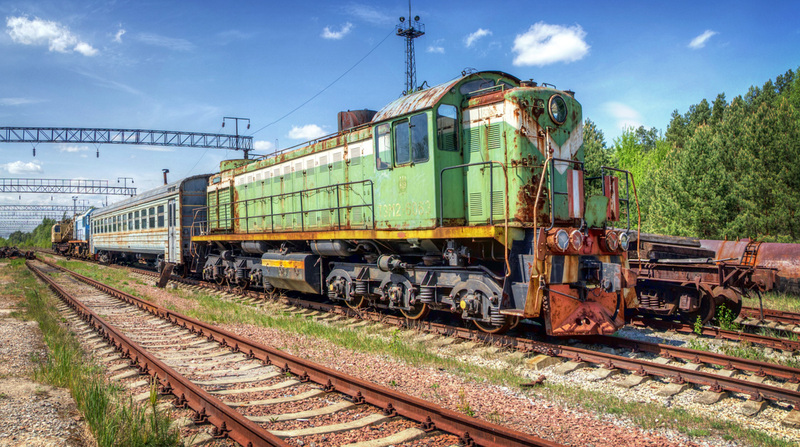 The first railroad in Ukrainian territory was constructed from 1866 to 1871, connecting the cities of Odessa and Balta for transporting grain. 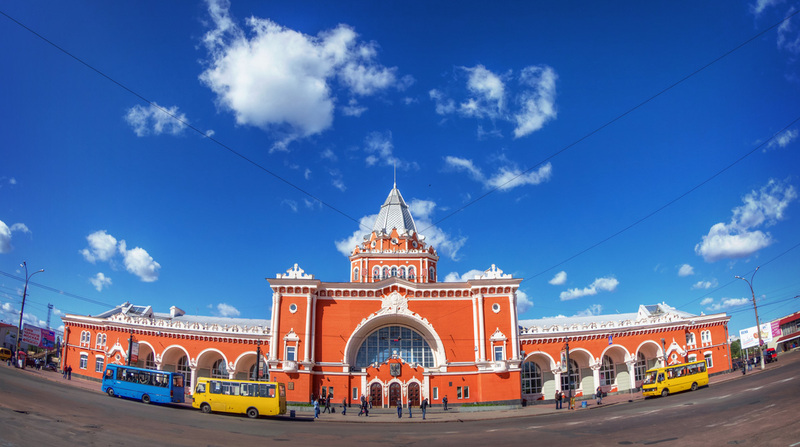 Additional lines were constructed in a fast pace in the 1870s, eventually connecting most large Ukrainian cities, and providing a rail link to the center of imperial Russia: Moscow. After World War I construction of railroads continued, connecting smaller cities and villages to the rest of the country, like the cities of Ovruch and Chernihiv. 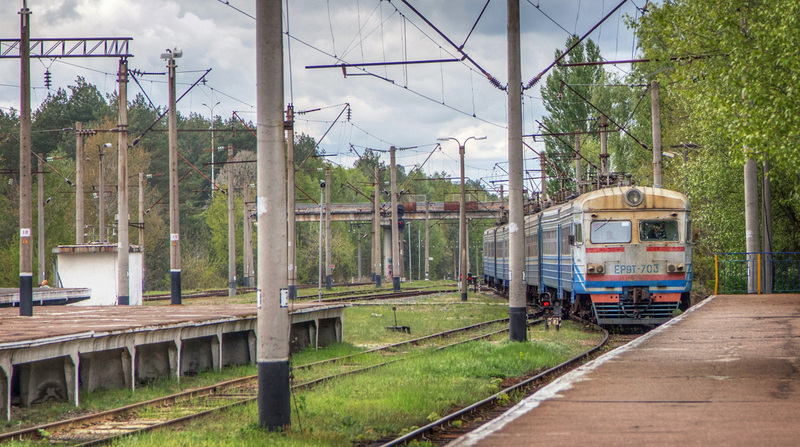 For a rather unimportant line, the rail link between Ovruch and Chernihiv was fraught with problems from the get-go. Construction on the line began on February 20th, 1927, using labor from the 17th Battalion of the military's railway division, as well as locals that had horses and even forced labor. The final length of the line would be 177.6 kilometers, 77 percent of which was in Ukraine, and 23 percent in Byelorussia. Much of the land was sparsely populated and was made up of dense forests and swamps - there were roughly 35.5 people per square kilometer, and 35 to 65 percent of the land was deemed infertile for growing crops. 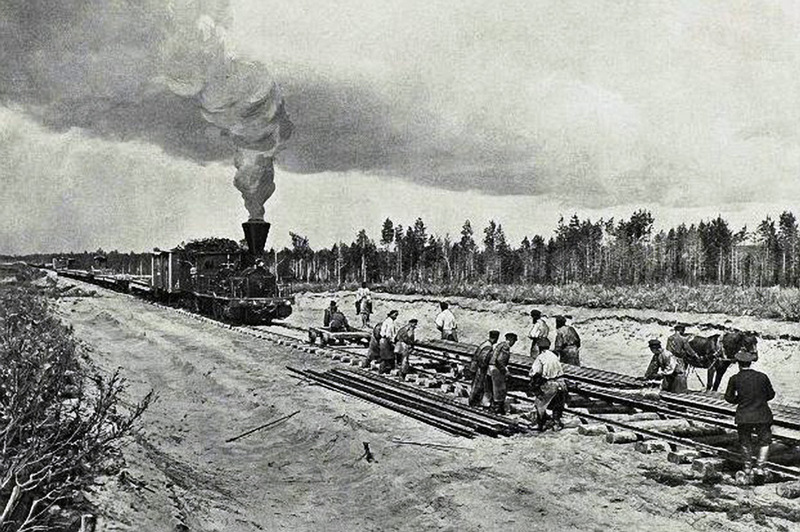 Constructing railroads in the Russian Empire. 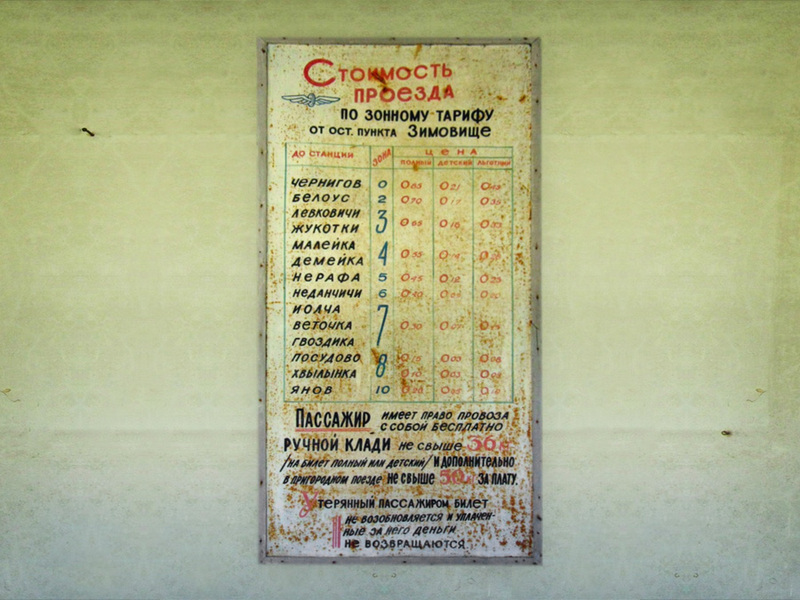 From the collection of Evgenii Alimov, Local History Museum of Slavutych and Chornobyl. Initial excavation was done the old fashioned way - 500 horses were employed with the task, as well as men with simple spades and wheelbarrows. Many of the workers lived in cramped barracks located along the route with inadequate sanitation, which led to outbreaks of both typhus and dysentery. Poor conditions - including flooding and waist-deep swamps, likely didn't help either. Initially men slept on straw mats and cooked their own food over fires, however incentives like increased rations and better accommodations were offered to encourage quicker work and to make deadlines. Track-laying commenced in stages - starting July 12th from Chernihiv west towards the Dneiper River, on July 15th from Ovruch east toward the Pripyat River, and on August 15th from Pripyat west toward Ovruch, meeting the previous construction group in the middle. 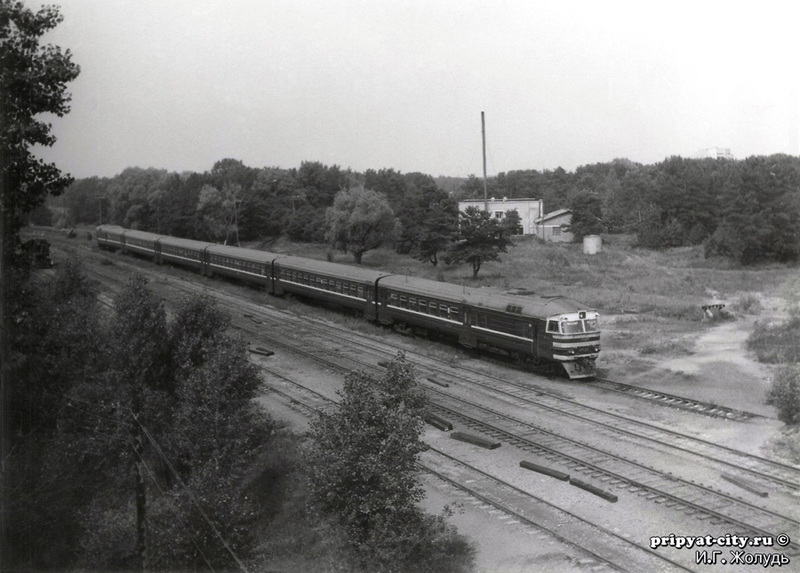 Locomotives and passenger cars were shipped by river to these work sites - 69 coaches and two locomotives for Chernihiv, and 101 coaches and 4 locomotives for Yanov, on the west bank of the Pripyat River. The laying of tracks was completed by September 1927, but two integral parts were missing - the Pripyat and the Dneiper River bridges. These two bridges were significant stumbling blocks to success for the railroad, which operated in 3 individual pieces until the bridges connected them together. Throughout the task, several bridge workers were stricken with compression sickness while working on the bridge's caissons. And on July 4th of 1929, the nearly completed Pripyat River Bridge collapsed entirely during a significant storm. Until the bridges crossing these rivers were complete, ferries were used to complete the journey, and special pontoons were available to float locomotives and wagons across the rivers. Mismanagement was prevalent throughout the entire job - in 1928 several bridge builders were brought up on charges for violating specifications and for mismanagement. Cheap materials were used to cut costs, but also because some of the materials, like high quality iron, were simply not available. In one instance over 400 telegraph poles needed to be replaced as they were installed poorly and without metal supports. Once the railroad was finally operating, difficulties continued. In 1929 only 48% of the locomotives were in working order, and it often took three to six months to even start work on repairing each. Most embarrassingly, one locomotive ended up in the Dneiper River, assumedly after derailing. The line was, however, completed in its entirety by the very end of 1929. With the onset of World War II and Nazi soldiers pushing further eastward, the retreating Soviets followed a "scorched Earth" policy - leaving nothing of value for the Nazi occupiers. This included the destruction of both the Pripyat and Dneiper River bridges in 1941. Liberated in 1943, the bridges were reconstructed only in the late 1950s, reflecting either the lack of importance of the line, or simply the fact that there were many other tasks of higher priority to be done first. Were it not for a chance event, the Ovruch to Chernihiv line could be operating in obscurity to this day. In a country known for its fertile farmland, the land surrounding these rails was swampy, unfit for farming, and sparsely populated. But for these very reasons it fit the bill for a nuclear power plant. RBMK reactors - like the ones built at Chornobyl - required immense amounts of water to properly operate. The best location for such a plant would be near a natural water source, and with open space to create a vast cooling pond. The ideal cooling pond would take up at least 20 square kilometers, which would be a significant investment of land in a territory used for farming. But since the area was unfit for that use, and right near the natural waters of the Pripyat River, it became a top candidate among 12 others for Ukraine's first nuclear plant. When the list was whittled down to two candidates, the other being Ladyzhin in Vinnitsa Oblast, it was the nearby railroad, allowing easy transport of people and goods, along with the plentiful waters of the Pripyat River, that sealed the deal. Construction on the Chornobyl plant, and the city Pripyat, a home for the plant's workers, began in 1970. A 1986 timetable showing the long distance train schedule on the Ovruch to Chernihiv line. The stops listed are Chernihiv, Nedanchychi, Yaniv, Ovruch, Korosten, and Novohrad-Volynskyi. A chart showing the fares from Chernihiv to Yanov before the Chornobyl disaster.